Home > PC > Omega Quintet is coming to PC, courtesy of Ghostlight! Omega Quintet is coming to PC, courtesy of Ghostlight! 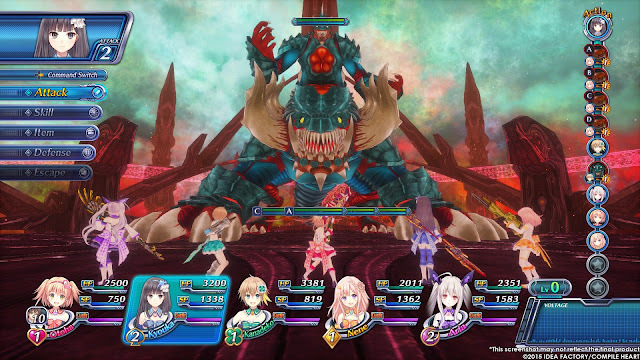 Just a few weeks after the announcement that it would be bringing the hugely underrated Lost Dimension to PC, UK localisation and publisher outfit, Ghostlight, has announced that it is also working on a port of Compile Heart's first PlayStation 4 JRPG, Omega Quintet. Related reading: Matt's review of Omega Quintet. Itself rather underrated, Omega Quintet is a fanservice-heavy JRPG (as only Compile Heart know how to do) that mixes a satire of Japanese idol culture and tradition with a complex combat system that itself is based on musical performance; the layout of enemies is effectively like the staves in a score of music. In other words, it's AKB48 mixed with a weird RPG where Beethoven's musical scores are the enemy. If that sounds weird and delightful, it's because it is. It was one of the first examples of its genre on Sony's powerhouse, and I was very fond of it back when I reviewed it. I remain very fond of it today, not least because one of the girls in the team, Nene, is just so cute and adorable and has great underwear and... I've gone too far, haven't I? Players should of course go in expecting plenty sexytime nonsense; this is a game where the girls will cover themselves up and yell at you, the player, for tilting the camera to look up their skirt (but not before you get a good look anyway), and there are plenty of scenes where the girls are shown in various states of undress. And of course, as they take damage in battle their clothes tear. This is, of course, Compile Heart's trademark sense of humour, and it is often very funny. Give it a go and you may well find the underlying systems to be interesting and addictive indeed. In addition to porting the game from PS4 to PC, Ghostlight is committing to supporting multiple screen resolutions, mouse/keyboard and controller support, cloud saving, and Steam achievements. We don't have an announcement of the release date of the game just now, but it will be coming in 2017.